The Great War is over! Now 24,463 Auckland Weekly News Supplement photos for the period August 1914 to December 1918 have been more fully described so that they can be searched by description and subject. This means they will be more searchable and useful for librarians, social and family historians and genealogists. The photos cover that period’s social, political and military history from a New Zealand perspective. While there is obviously a national emphasis, many photos reflect this country’s involvement with international events in an important period of New Zealand’s history. 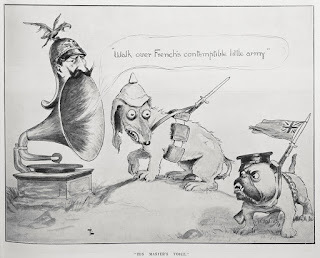 This can be seen in the following Trevor Lloyd cartoon from October 1914 demonstrates New Zealand’s loyal support for Britain as they face Germany’s massive armies of mangy curs invading Belgium. Ref: Trevor Lloyd for the Auckland Weekly News, "His master's voice", 22 October 1914, Sir George Grey Special Collections, Auckland Libraries, AWNS-19141022-47-2. On now on the 2nd floor of the Central Library is our latest exhibition, Behind the camera, featuring a selection from photographers and photography studios whose work is now held in Sir George Grey Special Collections. 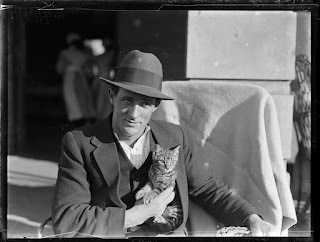 Ref: New Zealand Herald / Auckland Weekly News, Seaman Kehoe and cat from the S S Wiltshire, June 1922, Sir George Grey Special Collections, Auckland Libraries, 1370-0568-05. Last year in the Special Collections reading room I came across a slim volume titled Religion and theosophy, a lecture delivered on Sunday afternoon in the City Hall, Auckland, New Zealand on Sunday afternoon, March 26th, 1893 by Lilian Edger, M.A. Intrigued by the title I wondered about who the woman was who had given this lecture. 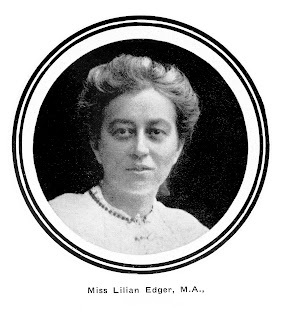 After a little digging I found Lilian Edger was a scholar, lecturer, author, educator and prominent Theosophist. More well-known is her older sister Kate who was the first woman in New Zealand to gain a university degree. Lilian was also an outstanding scholar, obtaining her B.A. at 18 and her M.A. with double first-class honours a year later from Canterbury College. Ref: Theosophy in New Zealand, New Series v.7:no.2, April-June 1946, page 47, Auckland Libraries, SERIAL 212 T39.